When they're on the front lines with the U.S. infantry, it's often been said that there are two kinds of people—the quick and the dead. But it's a different story for infantry scouts. They're the ones the enemy aims for, according to Spc. Serrano Brooks, Headquarters and Headquarters Company, Task Force 2-9, scout. "If they take us out, then we can't relay their position or tell our headquarters how many soldiers they have," Brooks said. Infantry scouts have the thrilling and often very dangerous task of getting eyes on the enemy. "We leave before the rest of the unit to go out and find the enemy," Brooks said. "We should never be seen by the enemy and we don't engage the enemy in direct contact." For Brooks and his team, the mission puts a lot of pressure on them. "It's a big weight on our shoulders," said Pfc. Daniel Warner. 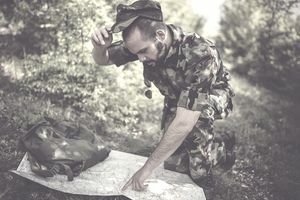 "An entire team, squad, platoon, company, or battalion could be affected by the decisions you make." According to Brooks, "The SALUTE report is a guideline so we can give an exact report on enemy activity." For the most part, scouts carry the same equipment as non-scout soldiers. "We take the normal stuff that a line soldier would take," Brooks said. "The only difference is that when we go out, the only contact we'll have with headquarters is on the radio. Other than that, we're on our own, so it's important to ensure that we have all of our equipment." In other words, there won't be any opportunity to collect forgotten items later. It doesn't matter to the scouts what the weather is like. The mission still has to be completed. "Rain, sleet, snow, or a clear night, we have to do our job, so the rest of the unit can do theirs," Brooks said. Brooks said the best part of being a scout is the camaraderie that builds with the other members of the team. "We spend a lot of time together, so we get to know all about each other," he said. "And that's important because you want to know the guy next to you is someone you can trust. And after spending enough time with them, I know they have my back, and they know I have theirs." When he was asked about the most important thing to remember while out on patrol, Brooks had an immediate response. "Don't be seen," he said.